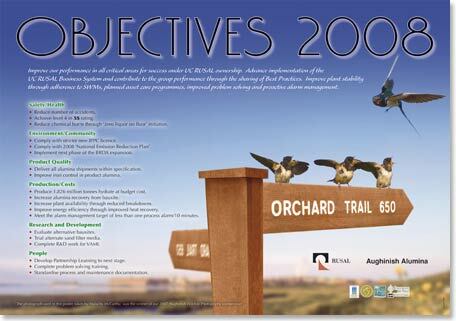 Acollection of posters prepared for Aughinish Alumina outlining the objectives of the Company. A wildlife theme is choosen each year as a backdrop to the objectives to reflect the Company's commitment to good environmental practice and highlight their awareness of the plant location in an area that is of international importance for a number of wildlife species. The posters are designed through the medium of photo montage using images taken on Aughinish Island, illustrating the diverse wildlife in the area.